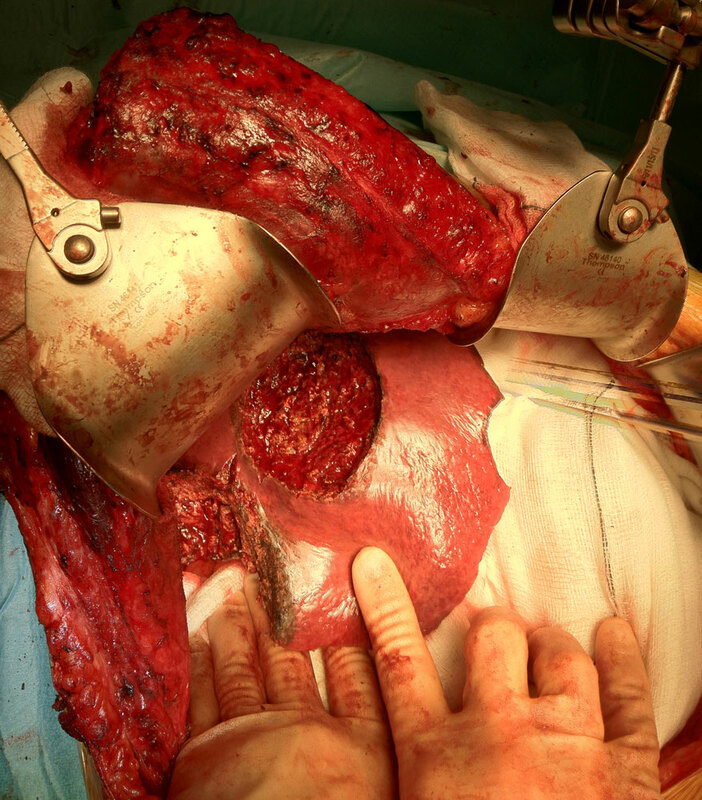 In liver surgery, it’s often important to know the exact layout of the connections the liver has to the rest of the body. Here are some images which hopefully make it clear. The liver is unusual because it has two blood supplies. The first is an an artery, the hepatic artery, which carries oxygen to the liver. The other is the portal vein which carries blood from the guts to the liver and contains the nutrients from food. 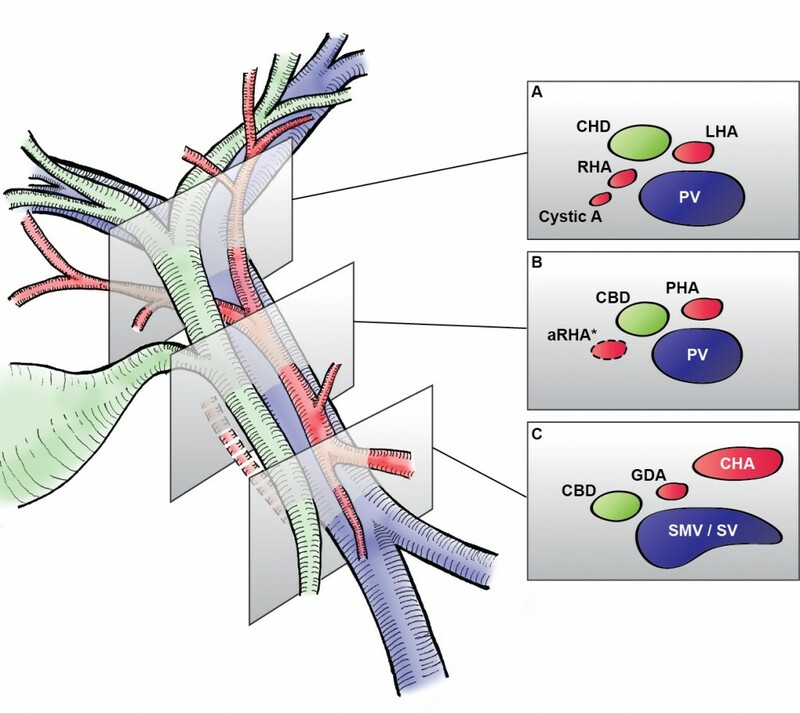 The portal vein carries 3 times as much blood as the artery and is not to be messed with – 34% of patients with a portal vein injury do not survive. The other important tube is the bile duct. This drains bile from the liver to the guts. If it gets blocked – by a gallstone or cancer – the patient becomes jaundiced (the skin going yellow). We use an ultrasound machine to visualise the vessels and the bile duct. It can be tricky and difficult to interpret. The boss has a good technique for getting orientated – the Mickey Mouse sign. When seen in the transverse plane – imagine sitting at the patient’s feet looking up through the body towards the head – the large portal vein with the artery and bile duct in front looks like Mickey. I use this technique every time. Intraoperative ultrasound to portal pedicle. Patient consent for publication obtained. Tweets of Surgical Colleges – what does it say about them? 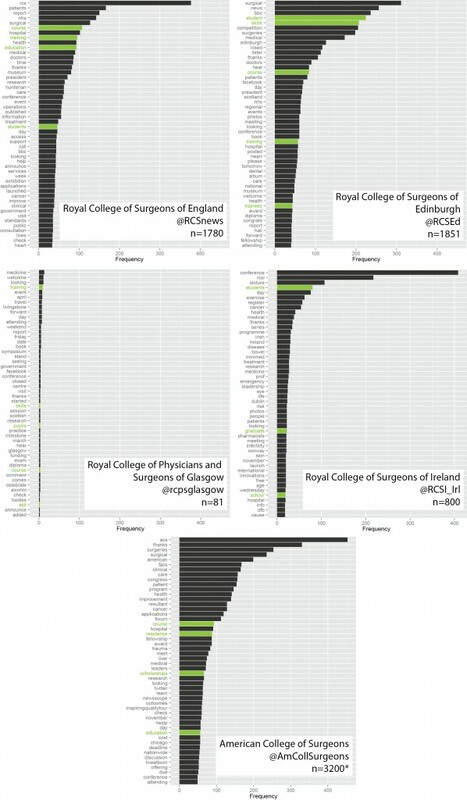 What do the UK and Ireland Surgical Royal Colleges tweet about and how do they compare to the American College of Surgeons? Twitter allow retrieval of the last 3200 tweets of a given user. Here are all tweets ever sent by the Royal Colleges a few days ago. The American College has tweeted over 6000 times, so only the latest 3200 are included. The Glasgow College is just getting going. There is a bit of processing first. Charts are generated after removal of “stop words” – all the little words that go in between. Words then have common endings removed (e.g. -ing; stemming) and the most common ending for the group replaced (stem completion). So what can be said? I was interested in whether Colleges tweet about training. I was pleased to see that the UK colleges do – a fair amount. Terms that are associated with training were less apparent in tweets from the RCSI and ACS. The figures below show clustering of terms within tweets, with term frequency increasing from left to right. There are some nice themes that emerge. In the RCSEng tweets there are themes relating to “training”, “events”, “working time”, and “the NHS”. Similar subjects are apparent in RCSEd tweets, with prominence of their medical students surgical skill competition and issues specifically relating to the NHS in Scotland. 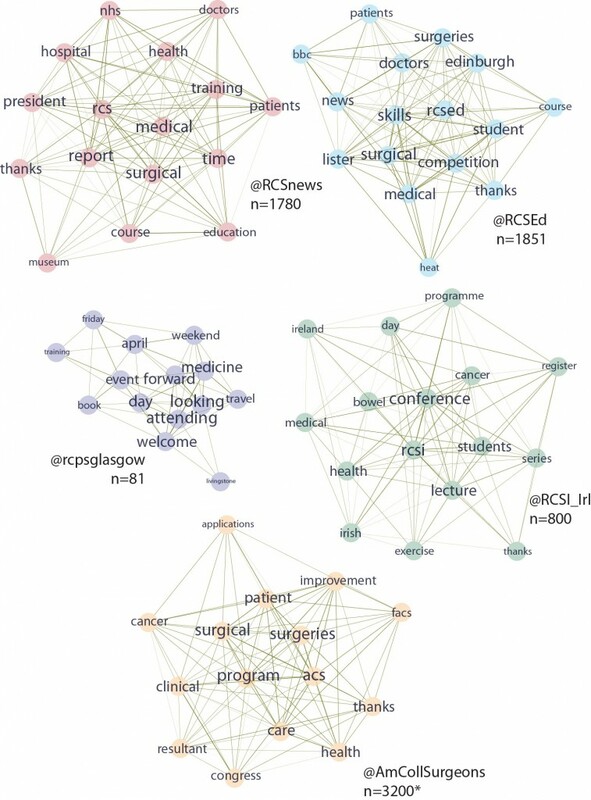 As the RCPSG have only started tweeting, associations are greatly influenced by individual tweets. The RCSI’s “Transition Year Mini Med School Programme” “MiniMed School Open Lecture Series” (updated 22/04/13) can be seen together with conference promotion. The ACS appear to use Twitter to communicate issues relating to patient health improvement programmes more prominently than other Colleges. Network plots illustrate the strength of association of terms (weight of edges) and frequency of terms (font size of vertices). Do the terms in these plots represent the core values of these organisations? 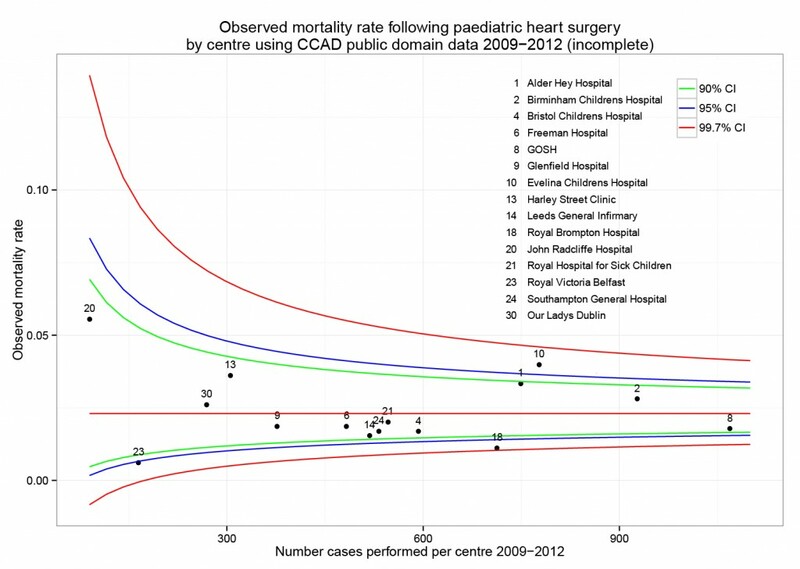 The National Institute for Cardiovascular Outcomes Research (NICOR) has published the results of its investigation into mortality after paediatric heart surgery in England 2009-12. 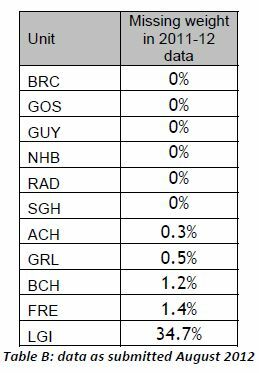 The short report has two main findings – the quality of data collection at Leeds General Infirmary (LGI) was woeful, and differences in mortality between all hospitals are likely to be explained by natural variation. The ability of an institution to collect and audit its own results can be viewed as a measure of organisational health. As can be seen in the table, the performance of LGI in this respect was terrible, and much worse than other units. A cause for concern in itself. On the more controversial point of whether the mortality rate in LGI was worse than other centres, no convincing proof of this has been found. 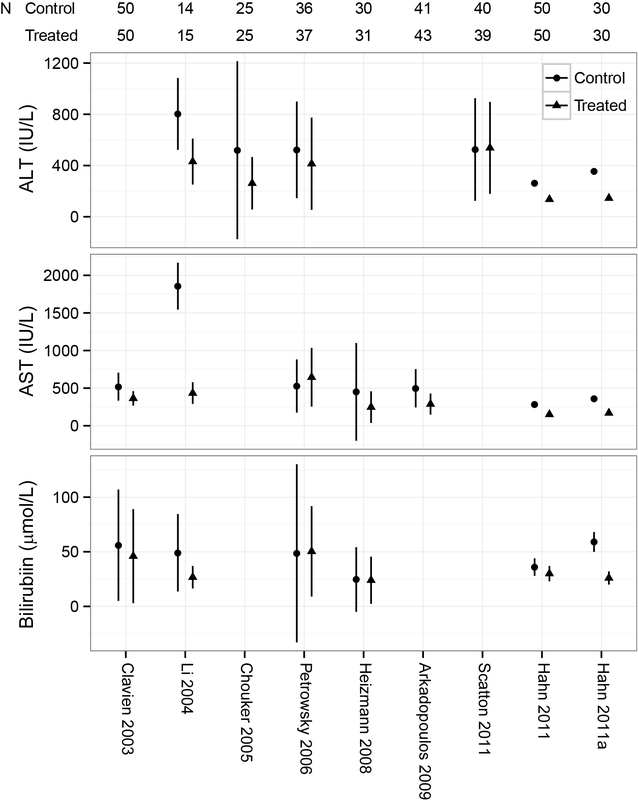 The funnel plot below shows the number of expected deaths along the bottom. Centres performing greater numbers of procedures have a greater number of expected deaths, just by common sense. These numbers have been corrected for the difference in the types of patients and surgery performed in hospitals – the specific procedure performed, patient age, weight, diagnosis, and previous medical conditions. All these factors impact on the risk of death following surgery. 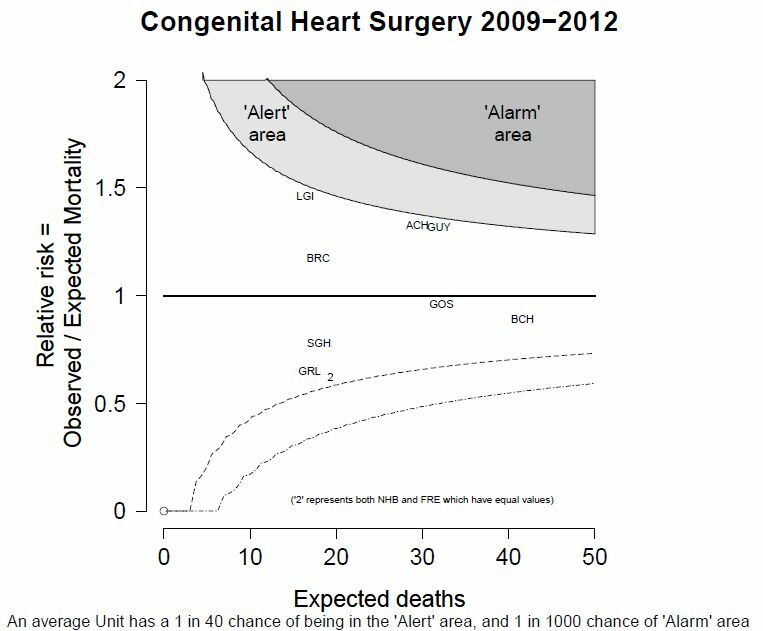 Any hospital above the black horizontal line has a greater number of deaths than predicted and any hospital below has fewer. By “the law of averages”, it would be expected that there was a roughly equal spread of hospitals above and below the line. As can be seen, Alder Hey, Guys, and LGI are all close to triggering an “alert”. The report rightly states that these units “may deserve additional scrutiny and monitoring of current performance”. The 3-year risk adjusted mortality rate in LGI is 1.47 times the national average – lower than the “twice the national average” first reported. The unambiguous message? Data collection and real-time analysis is core business in healthcare. Government and the NHS still do not have a grip of this. There are many more stories of significant differences between hospitals, hidden in poor quality data that no one is looking at. Chi-squared test of association for categorical data. Student’s t-test for difference in means of normally distributed data. The actual equations are straightforward, but get involved when group sizes and variance are not equal. Why do I use these a lot?! 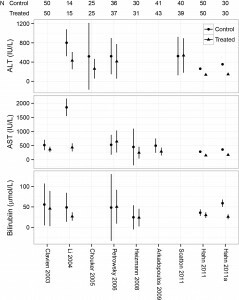 I wrote about a study from Hungary in which the variability in the results seemed much lower than expected. We wondered whether the authors had made a mistake in saying they were showing the standard deviation (SD), when in fact they had presented the standard error of the mean (SEM). This is a bit of table 1 from the paper. 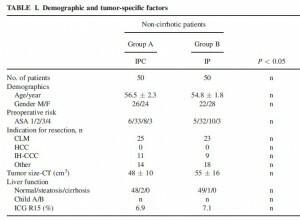 It shows the differences in baseline characteristics between the treated group (IPC) and the active control group (IP). 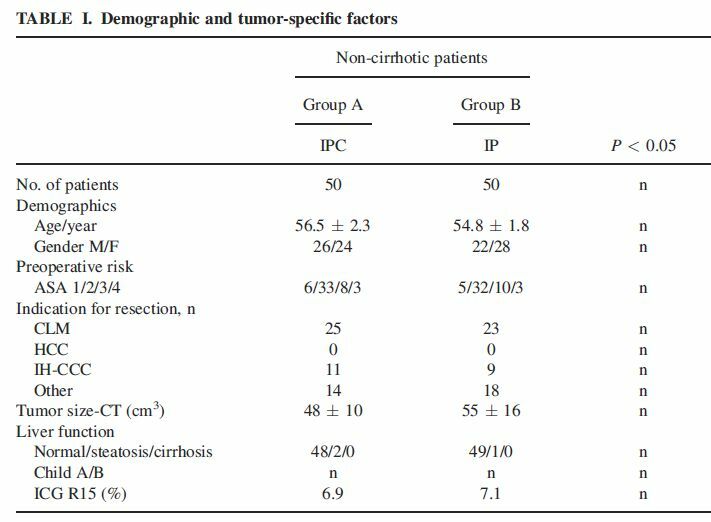 In it, they report no difference between the groups for these characteristics, p>0.05. But taking “age” as an example and using the simple script for a Student’s t-test with these figures, the answer we get is different. Mean (SD) for group A vs. group B: 56.5 (2.3) vs. 54.8 (1.8), t=4.12, df=98, p=<0.001. There are lots of similar examples in the paper. Using standard error of the mean rather than standard deviation gives a non-significant difference as expected. 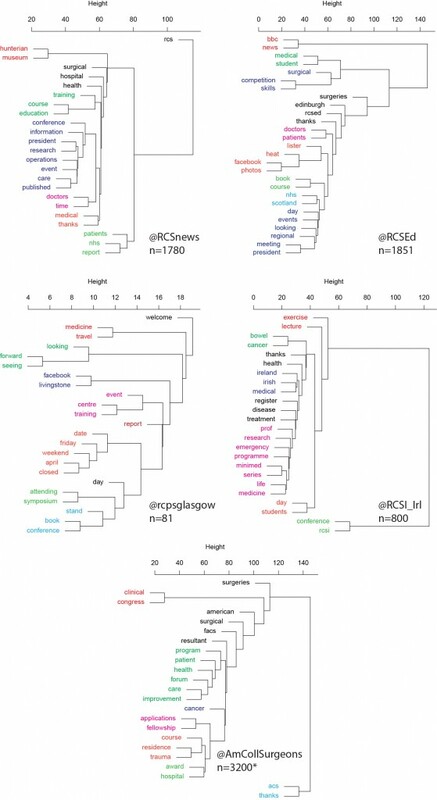 See here for how to get started with R.